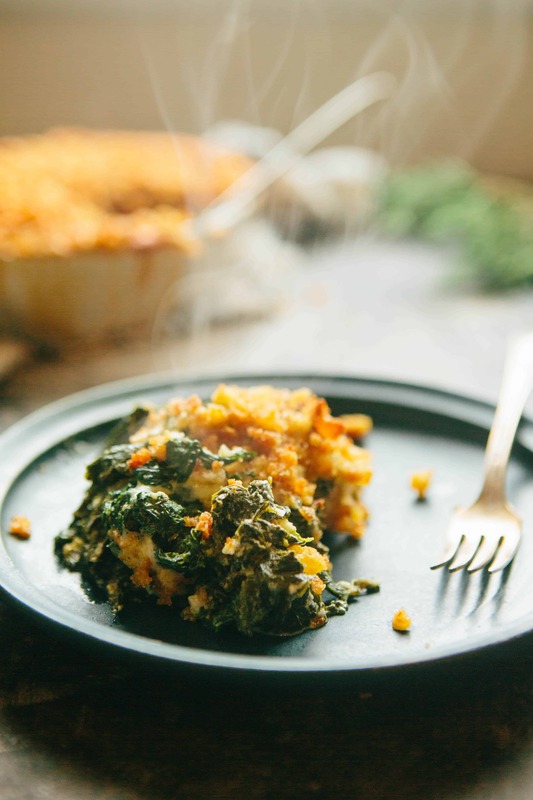 This kale gratin walks the line between healthy and indulgent. It’s the perfect way to eat your greens on a cold winter’s eve. Goodness gracious I can’t believe we’re already less than a week away from Thanksgiving. They say the older you get, the faster time slips by, and I believe it. Thanksgiving is my second favorite holiday right after Fourth of July, but it’s a close second. 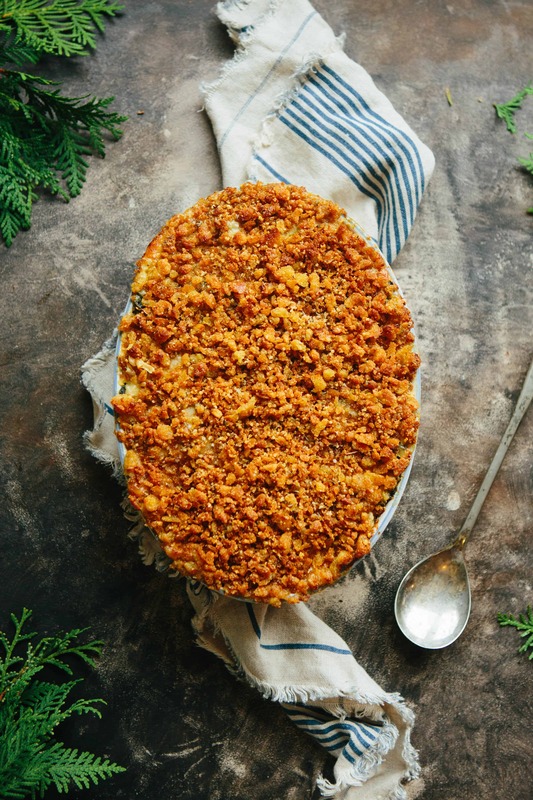 A day about being grateful and eating lots and lots of delicious food – what’s not to love? Well, I’ll tell you what. Grocery stores. They’re THE WORST this time of year. A few days ago I stopped into my local market to do my usual weekly shopping and the madness had already begun. The place was crawling with Turkey-Day shoppers. They seem to come out of the woodwork around holidays, and by “they,” I’m referring to people who don’t step foot in a grocery store any other time of year. They bumble obliviously through the aisles looking confused, eyeballs glued to lists, with their carts conveniently parked so that no one else can get by. As someone who spends a lot of time in grocery stores, this has become one of my biggest pet peeves. Normally I can zip in and out, dodging old ladies and blitzing through self-check out lanes fast enough to win a contest (seriously, come at me). But around the holidays I always need to budget extra time for shopping, and that’s precisely when I never have any extra time to spare (honestly, who does??). Okay, hold up. Let’s back track a minute. At the end of the day, I should just be grateful to have a grocery store, the money to afford to shop there, and the health to peruse the aisles swiftly and efficiently. I am. I promise I am, but sometimes it’s easy to forget. Thanks for letting me vent that out. 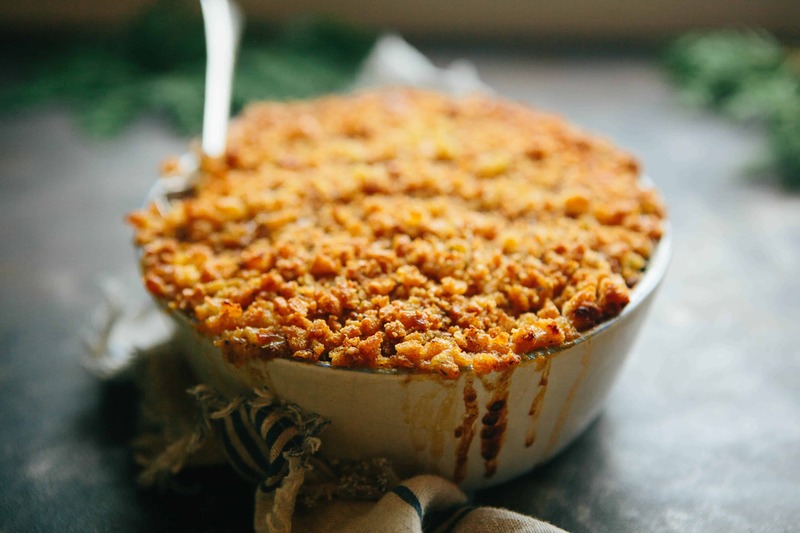 Now that I got that off my chest, let’s talk about this kale gratin. Grah-tahn. Say it! It sounds so much better with the French pronunciation than the butchered American slang that rhymes with “rotten”. 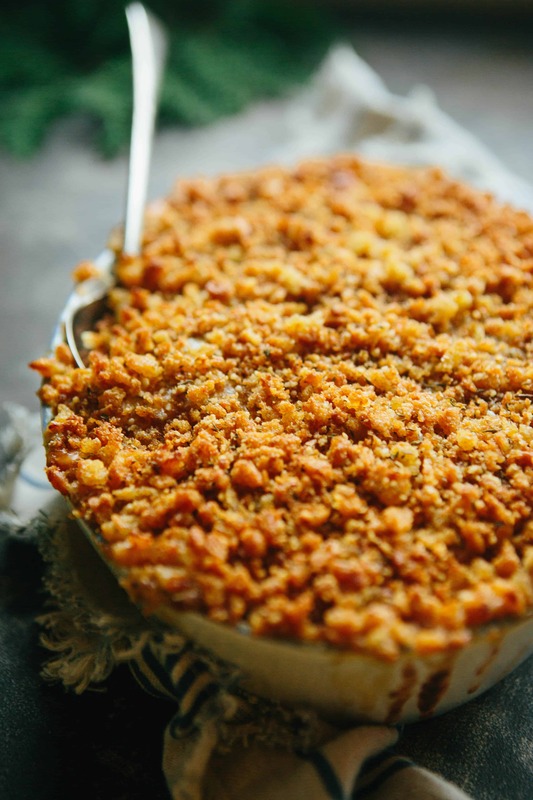 The word “gratin” simply refers to a French cooking technique that involves topping a dish with breadcrumbs, cheese, or both, and broiled to crispy, melty perfection. I never met one I didn’t like. 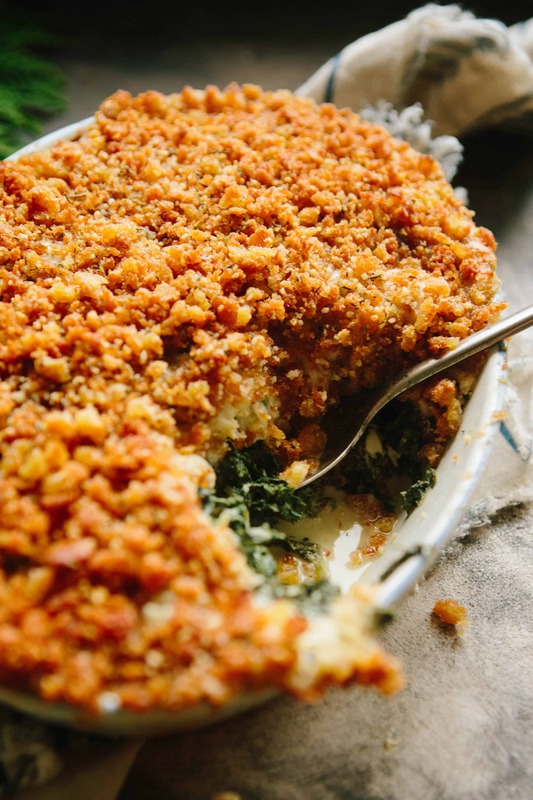 I’ve made many versions of a kale gratin before, but this is the one I always come back to time and time again. My recipe is adapted from the “Winter Greens Gratin” found in the December 2012 issue of Bon Appetit. 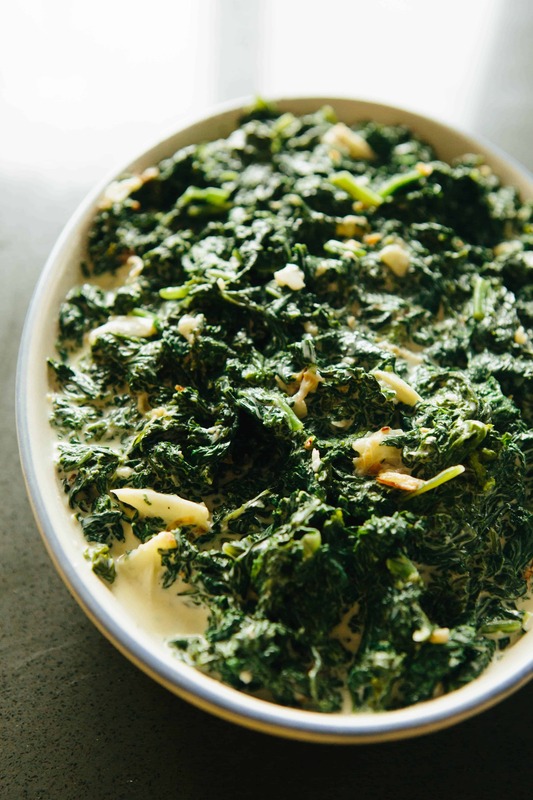 The original recipe calls for a mixture of kale and mustard greens, and I’m here to tell you that you can use either one, both, or any combination of hearty winter greens you have on hand. After closing down Soulberri at the end of October, we had quite a bit of kale leftover, so that is what I opted to use. The prep can be a bit lengthy, with de-stemming the kale, blanching, making the sauce, etc., but I promise you it’s worth it. I’ve done my best to cut down on the steps a bit, but you will still need to budget a reasonable amount of time to make it. The upside is that it feeds 8-10 people (or more if there’s lots of other food on the table) and it’s wonderful made in advance, making it perfect for a holiday that justifies a spending a little extra time in the kitchen. 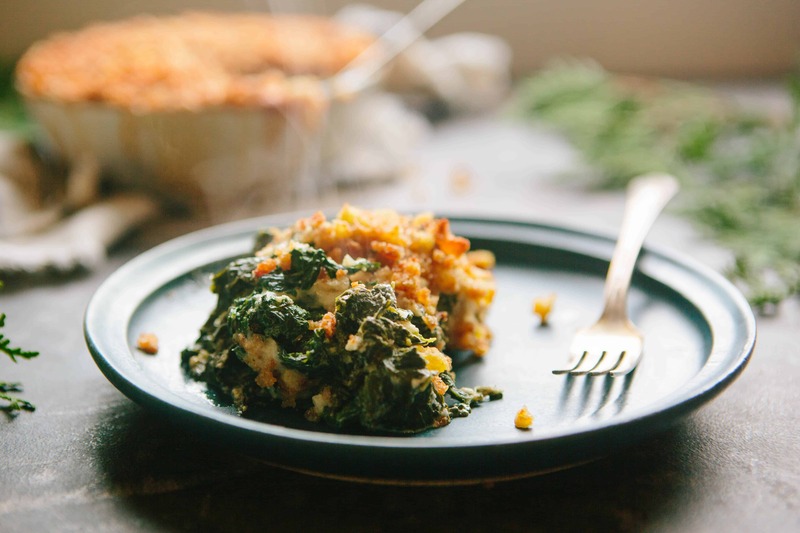 This kale gratin walks the line between healthy and indulgent. It’s the perfect way to eat your greens on a cold winter’s eve. Adapted from Bon Appetit December 2016. Bring a large pot of water up to a boil and season with salt. Prepare a large bowl of ice water and set aside. Drop large bunches of kale into the water, working in batches, and stir around gently until softened, about 3 minutes. Use a spider or large slotted spoon to transfer to the ice bath. Once cool, drain, then use your hands to squeeze out as much liquid as possible. Coarsely chop, then transfer to a large bowl. Heat oil in a medium skillet over medium heat. Add breadcrumbs and stir until crisp and golden brown, about 5 minutes. Transfer to a bowl, season lightly with salt and pepper, then stir in Parmesan cheese and 1 teaspoon thyme leaves. Wipe out the skillet, then melt 1 tablespoon butter over medium-high heat. Add shallots and stir until they turn golden and crisp, about 7-8 minutes, then transfer to the bowl with kale. To the same skillet, add the remaining tablespoon of butter and tablespoon of flour. Whisk until flour is absorbed, then whisk in half and half, garlic, and thyme sprigs. Bring to a simmer, then cook until mixture is thickened and reduced to about 1 1/2 cups. Add nutmeg, then season with salt and pepper to taste (you can go a little heavier since it’s getting mixed with the kale). Discard the thyme sprigs and garlic cloves if desired (I leave the garlic in and mash them up a bit with a fork). Pour sauce over the kale and toss to evenly coat. Taste and season again with salt and pepper. Transfer to a greased 3-quart baking dish. Sprinkle with Gruyère cheese and then with breadcrumbs on top. At this point the dish can be prepared up to 3 days in advance. Cover and refrigerate until ready. Preheat oven to 400 degrees. Bake, covered, for a about 25 minutes, or until the filling is hot. Remove the cover and continue baking until bubbling, golden, and melted, about 10-20 minutes more. Sprinkle with remaining thyme leaves and serve. Oh my goodness – that one cracked me up! Like you – I spend so much time in our local market that some folks think that I am an employee. It is a shame when after this many years of living here – the only people who know my name are the folks at the Acme and Ocean Beverage! Oh, well – hedonism does not get the respect that it deserves sometimes. I am going to make this as soon as possible since I love ‘grah-tahns’! I’ll let you know how it turns out but I am certain that it is gonna be a hit. Gorgeous photos! As much as I like to say grah-tahn like Ina Garten, my family will not convert. I feel you with the grocery shopping. I always hate it, but just imagine all the snowbirds I have to shop with this time of year.